We cover everything from setting up Android Pay, using it as your go-to payment tool, and even saving all of your loyalty and rewards offers. 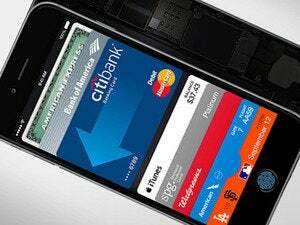 The promise of mobile payments is that you’ll never need your wallet again. Just a tap on the payment terminal with your smartphone will get you everything from movie tickets to groceries. In reality, we’re nowhere near ubiquity when it comes to ushering in this plastic-card free future. But after more than a year of substantial updates, Google is in a much better position to leverage Android Pay. If you buy in, you’ll find it’s not only a better way to pay for stuff, but you get the added benefit of a convenient digital container for all of your loyalty and gift cards. Optimizing Android Pay for everyday life takes a little bit of effort, but the payoff is worth pushing through the details. Android Pay uses NFC communication to make a secure credit/debit card transaction between your smartphone and the payment terminal. You’ll be prompted to tap your phone to the contactless payment terminal when it’s your turn at the counter. 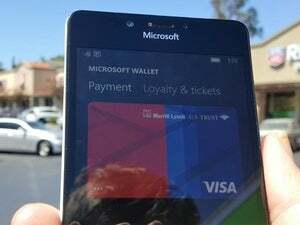 Use your phone to pay at a supported NFC terminal. Your default card (more on that later) will then be used to extract the money. Depending upon the system being used, you may have to enter your card’s PIN on the payment terminal’s keypad. You’ll get a push notification when the transaction is finished and the clerk will send you on your way. This peppy video from Google exaggerates things a bit, but in general it makes the point about how paying with your phone can be faster. Which banks work with Android Pay? There’s a very large and growing list of supported banks and credit card companies, so if you’re with one of the larger institutions then you should be able to get going without any problems. Lately, a whole host of regional banks and credit unions have added support, so odds are good that at least one of your cards is covered. However, you’ll want to check the details. Wells Fargo, for example, works with Visa but doesn’t support MasterCard or “co-branded” cards (those that are done in partnership between a bank and another retailer for rewards points). Also, Capital One is a mixed bag. Consumer debit, credit, and MasterCards work, but partnership credit, non-Visa credit, and non-U.S. cards won’t work. If your card is one of the lucky ones, tap Add a credit or debit card and you’ll be prompted to scan it and enter the three-digit code on the back. You can add a debit, credit, gift, or loyalty card to Android Pay. Android Pay handles multiple cards and allows you to choose which one to use as the default. If you’re running an Android 7.1 device, you can use an app shortcut to jump right to a specific card if you want to use that for a certain transaction. Launch a specific card from your home screen. If you have multiple cards, there’s probably one you use more than the others. You can set that card as the default. Touch that card inside of the Android Pay app, and then scroll down and select Set as default card. Any of your cards can be set as the default. This is the same spot where you can remove a card if you’re no longer with that bank. Android Pay works with Android phones running KitKat (4.4) and above that include NFC. Most major and budget smartphones released in the last few years should have this, but double check the spec sheet on your device to ensure that you’re good to go. You can check in your phone’s Settings to see if NFC is enabled. Make sure this is flipped on so you can get going with Android Pay. A fingerprint sensor is not required, but without one you’ll have to unlock your phone with its PIN or pattern every time you try to make a transaction. Look for either the Android Pay or NFC payment symbol. Anywhere that takes contactless payments should work for you. Note that you’ll sometimes see the contactless payment symbol on a payment terminal but it won’t be enabled. Yes, Android Pay can work there also. For example, Uber, Dunkin’ Donuts, and Fancy all can connect your payments from their app through Android Pay. Uber is one of several apps that integrate directly with Android Pay. For example, when your Uber ride is finished you’ll be debited from the default Android Pay card. The advantage of using Android Pay is that you don’t have to re-enter your credit card information for each app where you’re likely to spend money. In-app payments with Android Pay is supported on an app-by-app basis, though. The list is includes some of the most popular retail and service apps. Yes, Android Pay can work with merchants that support this feature. You’ll need to be using Chrome and one of a handful of supported merchants. Sites like Groupon now support Android Pay on the web if you’re using Chrome. Google says that Groupon.com and 1-800-Flowers.com support the feature, while more are coming down the line. Chrome has long included a capability to save a credit card, but this goes a step further by tying online payments directly to Android Pay. So is Android Pay different from Google Wallet? Yes. Google Wallet got ye ol’ “Google Pivot” and is now strictly focused on peer-to-peer payments, just like Venmo or Paypal. It’s a completely separate service. However, it works very well for sending and receiving money without any fees. Recommended for your fantasy league. How is it different from Apple Pay? Apple Pay requires a retailer with specific terminal that supports Android Pay—just any ol’ NFC terminal won’t necessarily do it. Additionally, Apple Pay only works with iPhone 6 and above, as a fingerprint sensor is required. On Android, a PIN, password, or pattern will work if you have a phone that doesn’t have a fingerprint sensor. Apple Pay also lets you pay with the Apple Watch, while Android Pay doesn't yet support tapping your watch to the payment terminal. What about compared to Samsung Pay? The major claim to fame for Samsung Pay it that, in addition to NFC, it can use Magnetic Secure Transmission (MST), which allows you to pay with your phone at terminals that don’t support NFC. It tricks the "swipe your card" reader into thinking it has swiped your Samsung Pay card. The downside is that it only works with a limited number of Samsung smartphones: the Galaxy S6 (and variants), Galaxy S7 (and variants), and Note5. It now works with the Gear S3 watch, too. Android Pay sends a virtual account number to the merchant, so your actual credit card details aren’t shared. The major difference between Google and Apple’s payment techniques is that Apple Pay uses a Secure Element, which lives on a physical chip inside the phone for storing encrypted financial data. Android Pay, just as Google Wallet did, uses Host Card Emulation. In Google fashion, this means the encrypted information is stored in the cloud. Android Pay will require you to have a screen lock on your phone so that no one can swipe your phone and then start racking up your card. However, you should always use good security practices and monitor your account to ensure that nothing unseemly has taken place. Because the retailers gets a one-time use token to a virtual card, your actual credit card details are safe. If a hacker compromises the retailers payment system, they can't actually steal anything useful. So paying with Android Pay is far more secure than using your real credit card. Touch the floating action button and then choose Add a store gift card. Search for the store, which is probably in the list if it’s a major chain. If the card is for a small store not in the database, you’ll need to hold onto it. However, if you’re adding a card for something like Best Buy or Target then you can scan it and you’ll have a digital copy inside of your Android Pay app. Expect a push notification when you are in or near the store where you can redeem it. That gift card you’ve had for two months doesn’t need to get lost in your drawer if you keep it in Android Pay. Pro tip: you’ll want to delete the card one you’re done with it. Otherwise you’ll receive notifications in perpetuity even after you’ve used up the balance. How do I add a loyalty card? The process is very similar. Touch the floating action button, find your store, and then scan the card. You’ll then have a digital barcode at the ready and the details of your loyalty program, so you can ditch that giant keychain full of loyalty cards. Scan a loyalty or gift card so it’s always with you. The app will ping you when you walk into a store where you’ve registered a loyalty program. This way you can swipe down and show the card right from the home screen. Most retailers now just take your phone number, but this can serve as a reminder that you should rack up points with your purchase. Does it work with Android Wear? Not really. At this point all you get is a notification that you’ve made a payment or when you enter a store where you can use Android Pay. There have been rumors about being able to pay with your wrist piece Apple Watch style, but we’ll have to wait for Android Wear 2.0 to see if this comes to fruition. This story, "Android Pay FAQ: Everything you need to know about Google's mobile payment system" was originally published by Greenbot.